The sliced version of Milo’s Venus is a tribute to Salvador Dalí (& David Lynch). Wood and spray paint, 1m20. Neon orange prototype version + 3 copies (different colors among white, red, black or other neon colors). Abducted by Francis Traunig since october 1st, 2018 & shown behind Geneva’s big police station in Albert Cohen’s street (Geneva, CH). 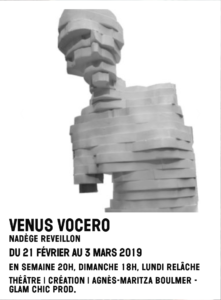 Used by Glam Chic Prod as a communication tool for a theater piece called “Venus Vocero” and played at Galpon (Geneva, CH) from February 21st to March 3rd, 2019. This sculpture was first part of an art installation for 16th edition of Black Movie festival, Geneva (CH) in 2015. The sliced version of Milo’s Venus existed in 2 polystyrene copies, 1m20 high. One is owned by a well known feminist artist in Geneva, the other is owned by the artist himself. The first polystyrene sculpture was made under technical advices from Lucien Langton. Posted in: everything, sculpture. Tags: 2019, bm, sculpture.